Why do trees never tell jokes? Because they’re afraid of being stumped! Tree remains are a major hazard and liability. Every day lawyers are filing liability claims for injuries caused by tree stumps. One great example is a recent case that happened in New York. A 50-year-old Brooklyn woman was out for a walk. While passing the front of an apartment building she tripped over a tree stump. The fall caused her to break several bones in her hand that required surgery. The fall also caused her to develop nerve damage and reflex sympathetic dystrophy. The woman’s lawyers were able to sue the city for a six-figure settlement. You can avoid injuries and liability claims by removing tree stumps. This guide provides you with an in-depth explanation of the different removal methods. We’ll also explain which method provides the most effective, fast-acting results. Tree services are complex and certain jobs can take a day or longer to complete. Hiring a professional will help keep you save from overexertion. We recommend finding a professional who specializes in stump grinding. Stump grinding should always be done by a trained safety professional. In addition to being trained, they need the proper insurance coverage. Should your property become damaged, they need to pay for the repairs. You can go one step further in protecting your assets by requiring they carry workers compensation insurance. This way if a crew member becomes injured you won’t be held liable in any way. They will have all of the equipment necessary to complete the job the first time. Along with having the right supplies, a good company will also have the right technique. Every root system presents a unique challenge for removal. A professional will first need to asses the tree remains. Once they know what they’re dealing with they can choose a technique. Large trees might need a two step removal process. DIY tree removal projects are dangerous. Grinders are dangerous pieces of equipment. These machines require training and protective gear for safe operation. At the very least, individuals operating a grinder need eyewear and earplugs. The machine is extremely loud and can easily cause damage to your eardrums. The biggest danger presented, however, is the teeth of the machine. The grinder operates with a set of carbide teeth and is ideal for small to medium sized stumps. The most frequent cause for injury is when an inexperienced person operates the machinery. Many times inexperienced users will allow their clothing to become entangled in the teeth of the machine. Usually, the injuries result in death or amputation. This was the case for a 33-year-old man in Michigan. Unfortunately, the young man didn’t have any training on how to run the machine. He was trying to remove a stump from his yard when his clothing became caught in the gears and he lost his leg. Other than presenting safety risks, renting equipment can cause expenses to rise. Getting a rental may seem like a money saver but it could also be a money pit if you don’t finish the job in time. Time-consuming issues can present themselves with every tree removal. It’s easy to underestimate how long it will take to finish the job completely. You’ll have to conduct research, find a technique, conduct the labor and clean up the mess. In total, you are probably looking at a job lasting 3 days or more. 3 intense days filled with countless opportunities for you to hurt yourself. It’s a lot safer to let a professional company take charge of the entire project. The grinding service is one of the fastest options available. This process also causes the least amount of disturbance to the surrounding soil. A grinder is a machine that eats away at the tree. You’ll be able to remove as far as 12 inches below ground level. The first part will consist of the grinding and the second part will use a tool for complete excavation. Add the left behind shavings to your compost pile. Next, fill any large craters left in your yard for safety reasons. You can fill craters left behind with a material such as loam. You will be able to keep nearby tree roots safe with the grinding method. However, not all professionals provide grinding as a service. Certain companies use rough excavation methods that can harm your landscape. Abrupt excavations can hurt nearby plant life and cause a significant amount of soil erosion. A good company will have new equipment to perform the removal service. New, top of the line removal equipment will provide you with the best, cleanest results. Tree roots vary greatly depending on the type of tree. A 30 ft tree could have roots that extend 90 feet below the trunk! Certain trees are ideal for digging up because they have a wide, flat root system. A pine tree is a good example of a tree whose wide, flat root system makes stump removal easy. However, other trees like oak trees have a deep root system. Their root system isn’t wide and spread out. An oak tree has a tap root that goes straight down into the earth. This makes oak trees a terrible candidate for removal by digging. Small trees have similar root systems to shrubs. Their shallow roots are ideal candidates for hand digging. You’ll still need a few tools other than just your hands. In order to complete the job successfully, you’ll need a shovel, ax, loppers and a root saw. Keep digging, exposing the tree roots. The method of hand digging can take hours and even days to complete. A lot of times people have issues with removing the entire stump. You could end up hand digging for days and still have a partial stump when you’re finished. Using a backhoe or skid steer is ideal for new construction areas. The entire process will break up a lot of ground and create a big mess. Now you can remove the small or medium stumps with a skid steer. Some skid steers have a pallet fork attachment while others have a bucket with teeth. You can rent out a skid steer but backhoes are more difficult to come by. Backhoes are especially handy when the soil is loose. In a planting area, you can use a backhoe to pull up on them. This method tends to be one of the costliest options. You will lower your expenses when there are multiple stumps on one site. When you have a lot it helps to be able to bury them on site. Being able to bury them on site eliminates the cost of hauling them to an off-site disposal area. Keep in mind that eventually, the ground around where you buried it will settle. Make sure if you are burying on-site the area is far away from foot traffic. You should also never dispose or bury them in a wetland area. Using chemicals will help accelerate the rotting process. Most garden centers sell chemicals to help with this. One popular chemical used for removal is potassium nitrate. First, several holes have to drill into the stump. Drill the holes in the top and on the side of the stump. Next, you pour the chemicals into the holes. The decomposition time will speed up significantly. However, chemicals are not a quick fix. You still have to wait anywhere from a few weeks to a couple months before its decomposed. Usually, after a few weeks, it’ll become spongy and pliable. This will make excavating the remains a lot easier. However, you can speed things up if you pour lighter fluids on the stump and burn it instead. It would still take a good amount of time and the fire presents an added danger. However, the work involved would be considerably less strenuous. A fire method could potentially work for one or 2 small stumps. Sometimes people will place scrap wood on top of the tree remains and start a fire. They allow for the fire to continue to burn until the stump is mostly gone. Before choosing a fire method, you have to consider the dangers and damage. However, if you have a lot of property with many trees remains, fire isn’t a good choice. Fire isn’t time effective and produces minimal results. In the end, you’ll still have a portion of the of the tree remaining in the yard. You’ll also have to deal with a burned spot on the lawn. You have to act quickly to stay ahead of the threats presented by tree remains. Waiting to remove them will only invite more problems into your life. Here are some of the immediate threats the tree stumps present to your property. Removing tree stumps will help keep unwanted visitors out of your yard. Decaying trees provide a living environment for pests, mold, and fungus. Many wood loving insects will seek refuge here. Nuisance insects like termites and fire ants. When pests like these are able to multiply they can end up affecting nearby properties. 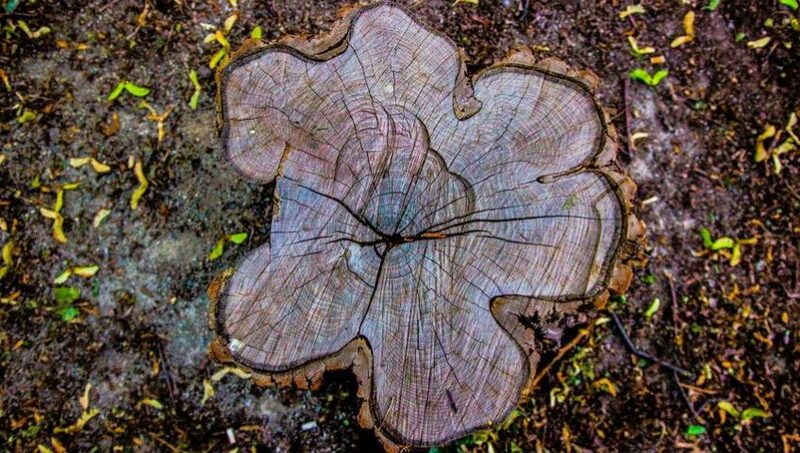 If the tree stump isn’t decaying it still poses an environmental problem. Nearby plant life could suffer as the barely living tree steals valuable water and nutrients from the soil. If the tree was very large and old it’ll steal even more water and nutrients from the soil. Children and tree stumps do not go well together. While adults might avoid injuries an energetic child will barely notice the decaying trip hazard. A lot of property owners argue that residents of all ages will know it’is there and be able to avoid it. However, when an injury occurs the court won’t listen to those arguments. It’s the property owners responsibility to eliminate tripping hazards. Furthermore, guests who are unfamiliar with a property won’t know what to look out for. Property owners who have tree stumps will never have the peace of mind they need. They are constantly at risk of a small accident turning into a major lawsuit. Tree remains make yard work more cumbersome. You will constantly be finding ways to avoid the inconvenient tree remains. You also have to consider the risk presented when mowing. You could easily damage your lawn mower if you accidentally run it over. When you’re weeding you have to be extra careful as well. Since rotting tree remains attract excess insects, you are at risk for a severe bug attack. What type of stump are you removing from your property? Take a moment and visit our project gallery for up-close photos of our finished projects. We can also provide you with a list of references showcasing our previous work. We provide our employees at Aquatic Consulting with Florida Workers Compensation insurance. Very few professional entities will provide this type of assurance. If any of our team members experience injuries on your property, they have coverage. We operate with extremely high safety standards and procedures. Still, in the unlikely event, damages occur, we will have the adequate coverage to pay for the repairs. Our team of expert professionals comes fully equipped to handle whatever job you have. We can handle removing tree stumps from Oak, Ficus, Palm, Pine and more. Our company uses brand new turbo-diesel powered grinding equipment. Even very large tree stumps can be easily removed in a timely manner. We want to provide you with the best service for our equipment grinds deeper than our competitors. As a result, the finished product is cleaner and better looking. Here at Aquatic Consulting, we will provide you with the best service and pricing possible. We’d love to hear about the project you want to complete. Contact us today for your free estimate. You can also visit our blog for more helpful project tips.